This was a couple of 'day trips' combined into one weekend with the kids. Started out Saturday at the JulyFest in Downtown Binghamton, and afterwards we headed to Syracuse. Went to the Spaghetti Warehouse in Syracuse before heading over to the baseball game at Alliance Stadium. 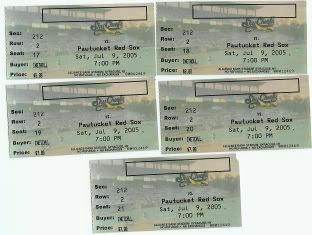 Main reason for going to the game was because Curt Schilling was pitching on a rehab assingment for the Pawtucket Red Sox. Came home after the game and got up bright and early on Sunday morning for the drive to Knoebel's in Bloomsburg, PA. Stopped at Bingham's Restaurant for breakfast and then drove to Knoebel's. Spent the day and into the evening at Knoebel's, and then headed home afterwards. Curt Schilling showed he's able to finish a game, pitching a perfect ninth inning in Pawtucket's 12-3 rout of the SkyChiefs on Saturday night in Syracuse, N.Y. Schilling struck out Kevin Barker, retired John-Ford Griffin on a groundout to first and Julius Matos on a flyout to right to finish off a well-rounded Red Sox victory. The right-hander was much sharper than his relief debut for Pawtucket on Thursday night, when he gave up two runs -- one earned -- on two hits in the ninth in a 7-3 loss to Ottawa. Red Sox starter Tim Kester (8-4) gave up five hits, one walk, three runs -- one earned -- and struck out five in seven innings for the win. George Lombard, Kelly Shoppach and Robert Petagine all homered for the Red Sox. Petagine hit a grand slam off SkyChiefs starter Shaun Marcum (2-1) in the fourth inning to give Pawtucket an 8-3 lead. Petagine led Pawtucket with five RBIs. Shoppach drove in four runs and Lombard went 2-for-4 with a team-high three runs scored. Chip Ambres was the only Red Sox regular without a run scored.